At CSz Seattle we do funny. Our comedians specialize in improv comedy, meaning our shows are based entirely on your suggestions. Our trained comedy professionals have no plan and willingly dive headfirst into almost any challenge the audience will throw at them, resulting in unforgettably hilarious moments. For those reasons, no two CSz shows are ever the same. We're best known for ComedySportz. 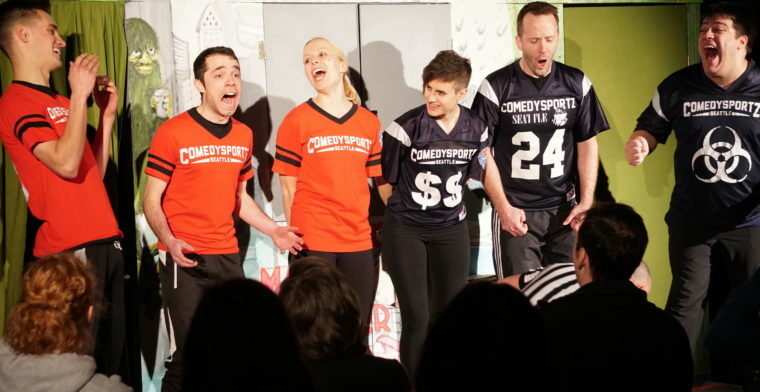 ComedySportz is improv comedy played as a sport. Two teams of comedians are pitted against each other in a variety of games, in which they compete for audience laughter. Every show is driven by audience suggestions, and you pick the winners, so no two matches are alike.